Earlier this week, the San Francisco County Transportation Authority Commission voted to delay nearly $7 million slated towards design and construction of the Caltrain downtown connection (DTX) to the Transbay Transit Center, citing concerns, among other things, over the leaning of the 58-story Millennium Tower. The woes of the Millennium Tower are unrelated. There is no physical condition that should prevent the DTX from being completed by 2025 as planned. But San Francisco will jump at any excuse to delay it. In 1999, the people of San Francisco voted by 69.3 percent to make the extension of Caltrain a top municipal priority. The value of DTX to San Francisco and the region was already well understood. Today most groups and individuals in San Francisco, on the Peninsula and elsewhere in the region recognize the traffic-reducing power of a first-rate passenger rail service extending between Silicon Valley and downtown San Francisco. Yet San Francisco’s elected politicians and the Metropolitan Transportation Commission (MTC) keep sidetracking the DTX. This lack of support for a critically important regional rail project began long before the Millennium Tower began to sink. In 2003, Prop K allocated $270 million in sales taxes to the DTX project. Yet some of those funds are still being held back by San Francisco leadership. Prop A, a $500 million sales tax measure passed in 2014, included no funds for DTX. And Prop J, which will be on the November 8 ballot, also includes no funds for DTX. 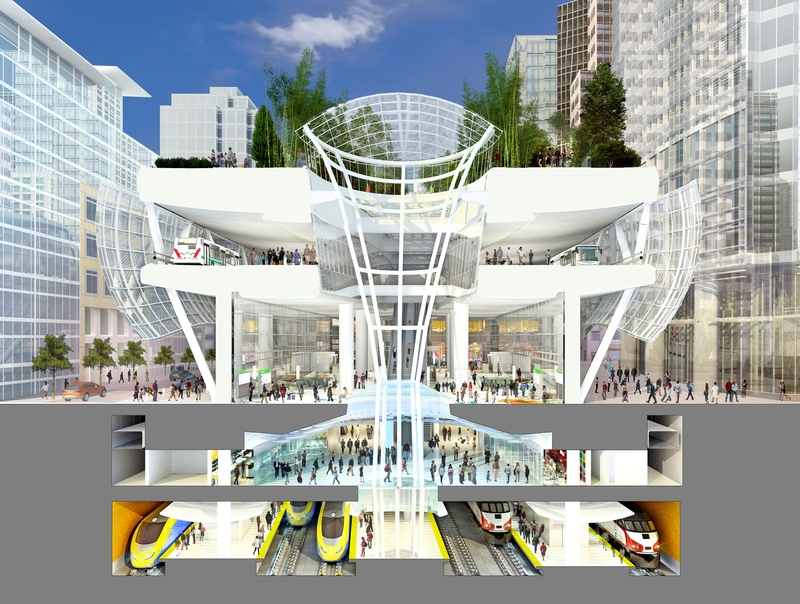 According to the Transbay Joint Powers Authority staff, San Francisco’s total contribution to the DTX currently stands at two percent, compared to the 34 percent in local funds going to the Third Street/Central Subway project. Tear down the northern part of the I-280 freeway. What happens to eight lanes of existing freeway traffic? No one says. Put everything in a subway so Mission Bay can enjoy a “full build out” without the bother of tracks and trains. Fine, if the extra billions needed to pay for the additional subways can be found. Relocate the strategically placed northern train storage and yards to some distant undisclosed location. That is neither practical nor necessary. It is strongly opposed by both the Caltrain Joint Powers Board and the California High Speed Rail Authority. Shift the tracks and the 4th and King Station to Third Street, where both subway and station would be placed 10 stories underground. Because of the high cost and extraordinary risk of constructing a deep station in very weak material, this is likely a non-starter. It is not wrong to examine alternative ways of developing Mission Bay. But it is wrong for the Mayor’s people to impede the long-awaited DTX project in the process. Instead of using the Millennium Tower as yet another excuse to gum up the DTX project, those responsible should be attending to the real problem: the Millennium Tower is sinking and tilting! What happens if there’s a major earthquake and the weak soils below and surrounding the building’s pile foundations floating in the mud liquefy? Human safety is at stake here and deserves the highest priority. But the downtown connection for Caltrain is a separate issue. Ya, take the train every day, it is loud, crowded, and bumpy. These improvements can’t come too soon. Wanna know what else would “significantly ease San Francisco gridlock”? More housing IN San Francisco so that fewer people would have to drive!